The Life of Our Ladybugs: Hip, Hip, Horray! It's Carly's 1st birthday! Hip, Hip, Horray! It's Carly's 1st birthday! Happy birthday my precious Carly girl! One year ago you blessed our family and my heart grew in ways I could not imagine. Thank you Lord for our perfect girl. May she be as much as a blessing to you and your kingdom as she is to our family. Carly I pray that you will always seek and follow the Lord. That you will always know you are loved and supported. That you will know the Lord is faithful, loving, and kind. Oh you have grown and changed so much this first year and so have we. Thank you my precious child for all that you have given me this first year of your life. 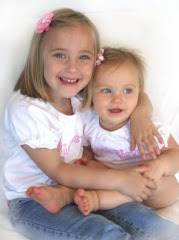 From your sweet wave to your sloppy kisses, the way you clap your little hands and the way you adore your big sister. You have shown me glimpes of pure, unfiltered love and it is good. She really CAN'T be a year yet! That's impossible! I adore that picture! Looking forward to seeing you at Girl's Night on Friday!